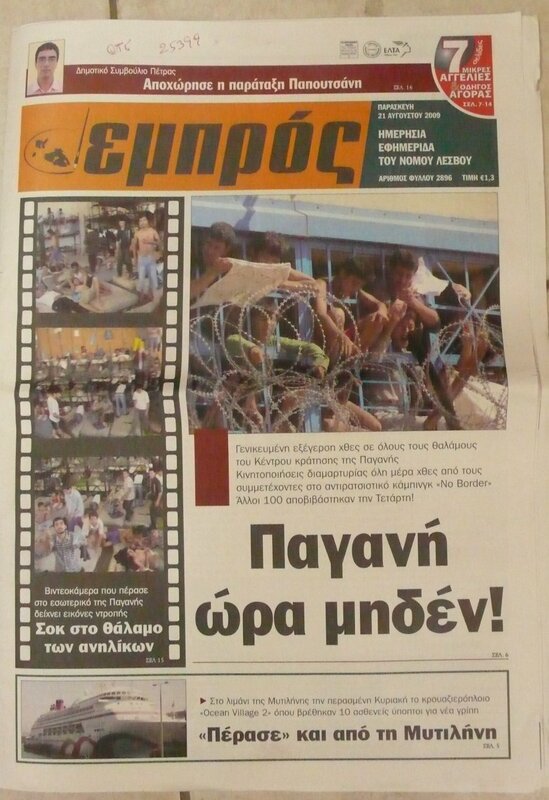 Published on August 21, 2009 in Detention and noborder lesvos '09. Closed Tags: frontpage, media, newspaper, pagani. We have great media echo about yesterdays demonstration, the island press picked up the issue of the unbearable conditions at Pagani. Today, we are front page on both newspapers, who report very objectively about what is going on in Pagani. But see for yourselves. 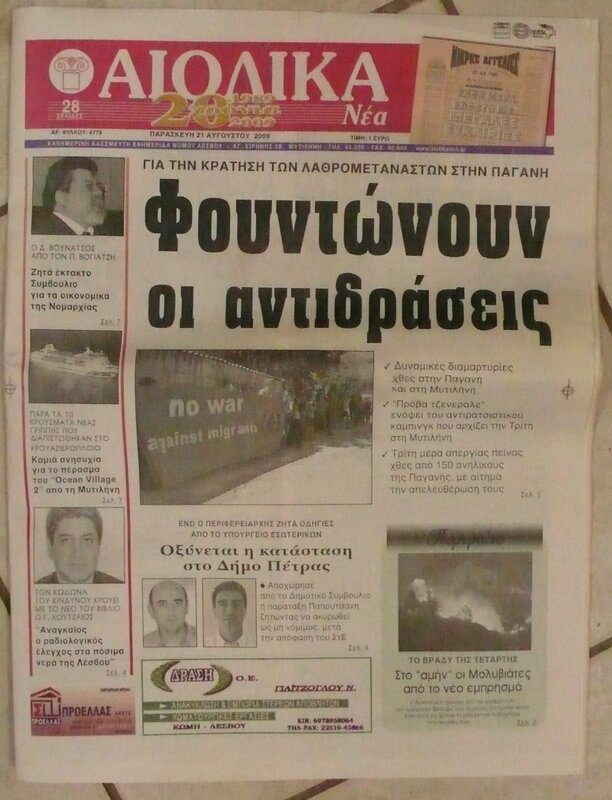 Published on August 21, 2009 in How to Lesvos. Closed Tags: travel. 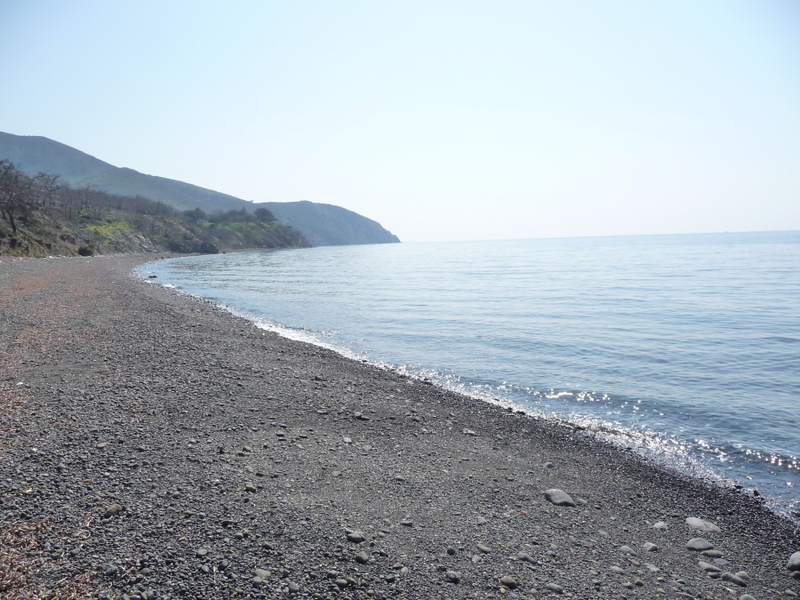 As always: Check the page How to Lesvos for complete information. And you can always check the How To Lesvos Category for updates, also alvailable as RSS. Published on August 20, 2009 in Detention, Featured and Videos. 16 Comments Tags: outrageous, pagani, voices. 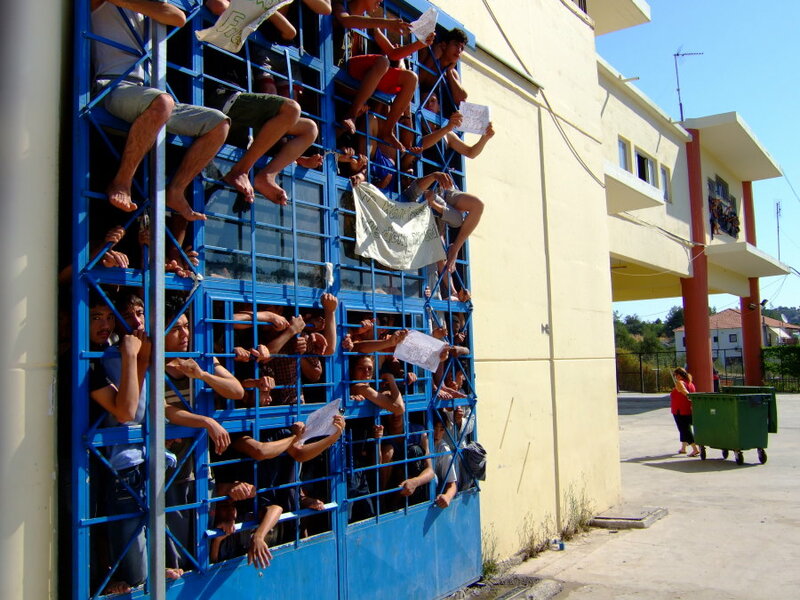 Published on August 20, 2009 in Detention, Featured, Lesvos, Photos and Revolt. 6 Comments Tags: outrageous, pagani. 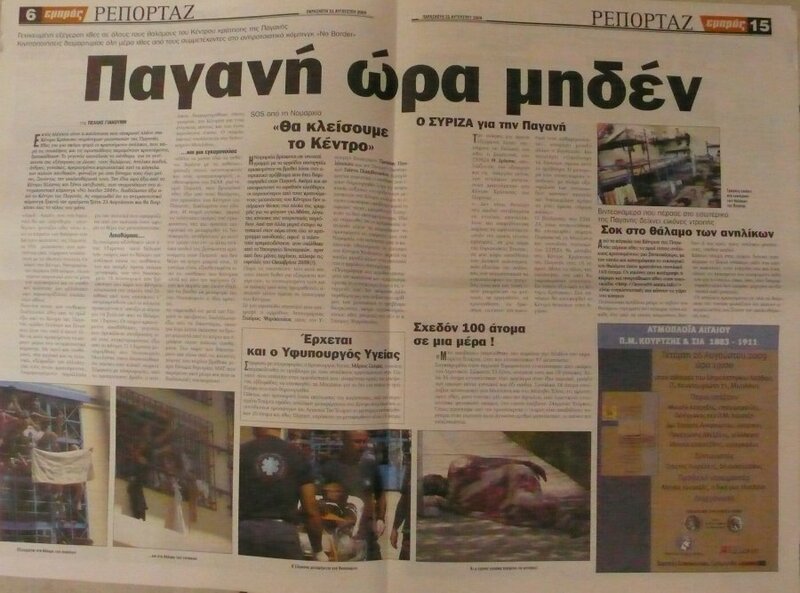 Published on August 17, 2009 in Detention, Featured, Insight and Lesvos. 1 Comment Tags: greece, pagani. The European elections, that took place during June 2009, brought the ultra right wing party “LAOS” to the fourth place for the first time in the recent Greek history. “LAOS” made a very open anti-migrant campaign based on the national security and immigration control. 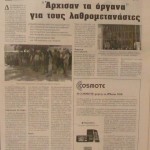 The support of this movement by the Greek media was and still is very obvious and, consequently, after the elections, the agenda that “LAOS” has set, has been adopted by several institutions and politicians across the political spectrum and mostly from the governmental parties, called “New Democracy” and “PASOK” (Greek Socialist Party). One of the outcomes of the above mentioned conservative and xenophobic campaign was the very recent presidential decree 81/09, which assigns the examination of asylum claims exclusively to police directors. It further deprives asylum seekers of the right to have their asylum claim examined at second instance, in violation of European standards. Published on August 16, 2009 in Featured, Frontex and Insight. 1 Comment Tags: Frontex, mediterraenean sea, political strategy. This article about the practices and strategies of Frontex concerning the European sea borders was published in the brochure Frontex – Widersprüche im erweiterten Grenzraum by the “Informationsstelle Militarisierung” in German. Here is a translated version without the references included in the original article. 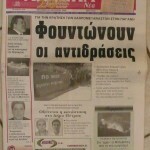 Published on August 15, 2009 in How to Lesvos. Closed Tags: dogs, mosquitos. If you don’t want to sleep together with the mosquitoes then make sure that your tent has a mosquito net or bring one. If you plan to bring your dog, the first thing you do you don’t bring the dog. But if you are already on the way, the first thing you do when you arrive is to speak with Fanis, the owner of the Kantina. Because his two dogs bark the whole night if another dog is around. Published on August 15, 2009 in How to Lesvos. 1 Comment Tags: pdf, reader. If you wanna come, and you want to know what you should know bevor coming and during the camp, there is the perfect thing for you, right here: The “How to Lesvos Reader”.